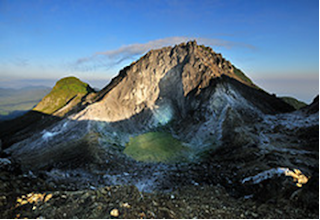 Sibayak Mountain Peak, enjoy the charm and cluster rocks and craters which blew smoke smelling of sulfur. In the morning we could see the beauty that give out the morning sun rays in between the rocks there. While the afternoon we will witness the beauty of the purple twilight, waiting for the sun toward the western horizon at dusk. From the summit of Mount Sibayak also visible in the distance some of the villages below and the summit of Mount Sinabung which is adjacent to Mount Sibayak.Mount it looks so beautiful and the main attraction many visitors, especially mountain climbers. On Saturday night, just like a cold night markets, usually at 2:00 pm is a favorite night for the climbers to climb to the top of the mountain, to see the beautiful panorama of the sunrise. From the top of the mountain looks the city of Medan, where in the evening, the City field looks more beautiful with glittering lights of the city. Mount Sibayak located high didataran Karo with a height of 2094 m above sea level. Circumstances mountain peak that has been devastated by the eruption in the pastCondensation factor on the mountain is very high which causes frequent fog seen clustered peaks and areas are still active volcanoes, craters and has a fairly gentle slope to descend and do not seem too dangerous as long as not too close, Clumps of smoke coming from geothermal and useful as a source of electrical energy. 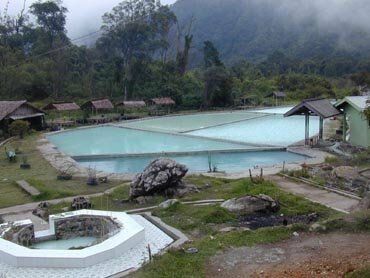 In Karo Regency there has been an area of ​​steam power plant near Mount SibayakFrom Village Sibayak, clear conditions are slightly sloping crater (visible from the rear area of ​​steam power plants), which seems like a split mountain. At around 15:00 pm, the fog began to look around the mountain top to the bottom, and not long after, the fog began to spread to the Spirit Mountain VillageMount Sibayak as the "Mountain King". Sibayak means king in Karo Batak language.